Now this is a whole new level of 'heroic dipiction'! Way cool styley, colours, and mood. Wonderful !!! 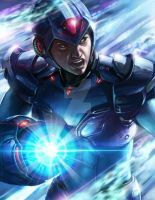 Megaman rocks the world !!! Title reminds me of Storm Eagle. The robot Megaman is standing on reminds me of something but what...? sothat's what megaman would look like in real life. PS: this is going to be my new desktop for a while. One of my favorite pieces in the book, glad to be alongside you in it! I like it...combines Megaman with those alluring photos of rusted old buildings or machines you see all the time. Is this of a particular Megaman enemy? Big thumbs up old buddy! Some of your more, shall we say, classic pieces have been in my rotation for quite some time. Glad to add a new one! Looking forward to seeing your name in the book. Just plain amazing! I can only hope to achieve something that has the same atmosphere and substance as this. Bravo! This is megaman in a way I wouldn't have come up with! It's like David after beating Goliath. I love the clouds. It all has a pretty, natural look, and I like the irony of that. oh man, that's a veeeeery cool fanart! Absolutely awesome! The world needs more Megaman fanart as good as this. Very cool. Even cooler than Toadman from Mega Man 4! amazing. whats the word on this? i heard they were gonna announce the "winners" but they never did. One of my top pics for the competition, great work! Wow this is great, I wish I could paint as freely as you do. wow, those clouds *_* amazing work! Brilliant piece of work.... absolutely love the composition.. background.. everything just goes perfectly.. Hope you it in the book.. This is an absolutely beautiful piece!One the BEST Megaman entries I've seen here.The painted look is absolutely unique and lend so much mood! I hope you get into the book,you definitely deserve it! Love the lighting effects here, and the overall setting is quite good. This is a brilliant take on MM. By any chance did you base the style on Ashley Wood? wow, what a beautiful piece!